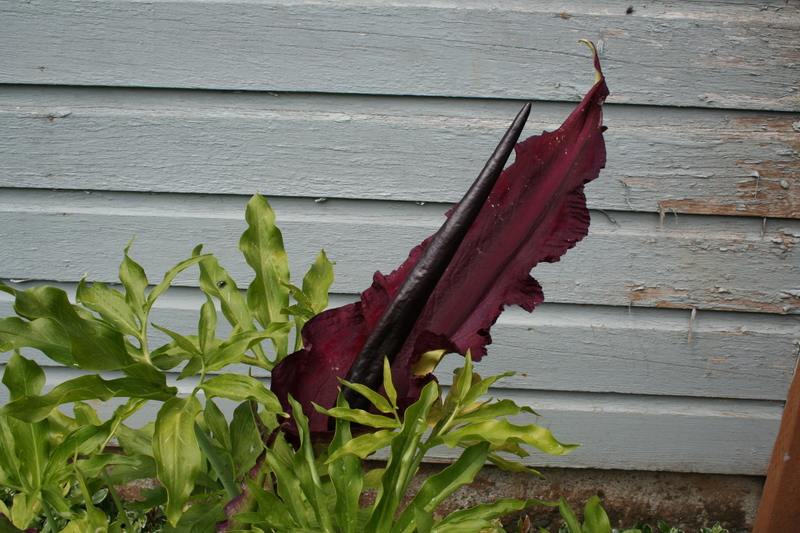 Normally our dracunculus vulgaris blooms on the 7th of June. And this year, we were all set for a Stinkin’ 30th Wedding Anniversary barbecue. But the rain didn’t stop, the cold didn’t warm and the Dragon Plant didn’t bloom. I was piddling around in the back yard Sunday (putting something together for Harvey) and I kept smelling this horrid dead animal smell. I thought: Don really needs to clean his barbecue… Then I thought: turn around and LOOK, Stupid! Oh yeah. It bloomed in time for the Stinkin’ Summer Solstice, a full two weeks late. This plant STINKS. 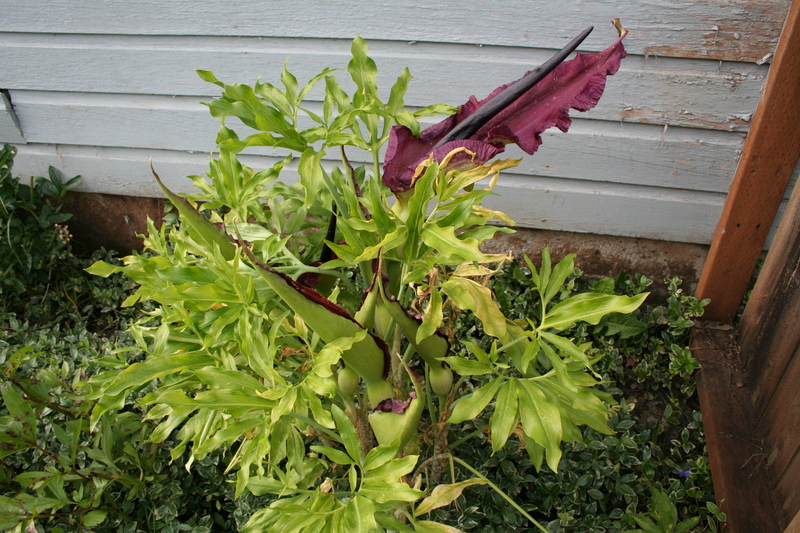 It smells so much like dead meat that the past two years, Murphy has bitten off the spadix on every bloom. I think he has not bothered the plant this year is that it must taste bad and he somehow (finally!) remembers that. Or he’s distracted with the temptation to get Harvey to play. Today, I smelled that smell (again) and realized another one had opened up. They only stink for a day which is a good thing because the flower is spectacular. I’m certain I have blogged about their history before: Don & I discovered them in the yard of a rental we lived in around 1984. The one plant that bloomed smelled so awful but produced such an incredible black flower that we figured no one would notice if we dug it up and moved it with us. And we did. That one bulb has been planted and replanted in every home we’ve lived in since, until it is now several clumps of plants in serious need of another dividing. The best thing about this flower (aside from the incredible beauty and obnoxious odor – that only lasts one day) is that it invariably blooms for our anniversary, June 7. This year, one clump has begun to bloom just this week – in time for the Summer Solstice (June 21). But the second clump (pictured above) won’t open for a few more days. Don’s birthday is next week. We should have at least one of these beauties in bloom for his birthday. And then they will fade, the flower will wilt and the spathe will sag. The striking foliage will turn yellow and die back. And we will dig one or both clumps up, separate and divide the bulbs, and spread them around the garden. 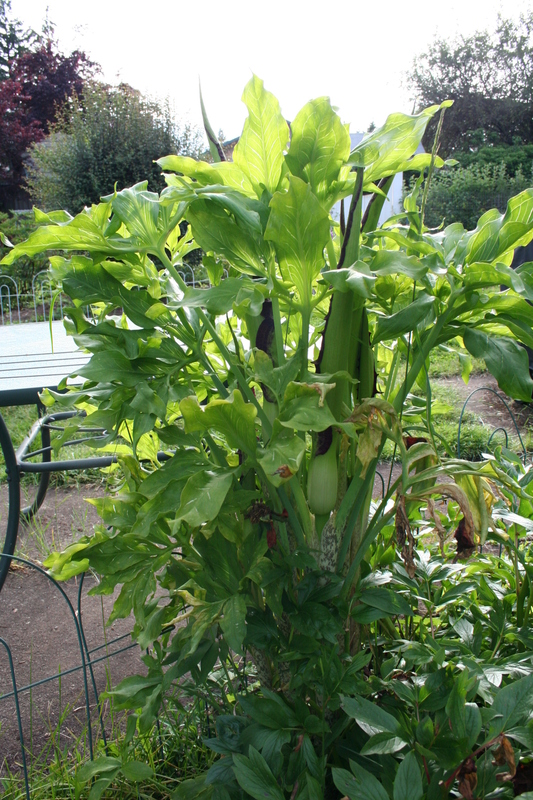 Tonight is the first time I have been able to find numerous sources on the Internet regarding this plant. We’ve loved it since our first whiff (OK, not so much the smell, but the deep purple-black flower) and no one has been able to provide us with much information. This year, I googled it and – wow! – all kinds of references. Just remember: they really stink for that one day. After that, they are just incredible to view. And they are not little plants! Ours are HUGE. We have one too that we’ve always called a black lilly. I think however, I shall change it’s name to “Voodoo Lilly”. I like that name much better!